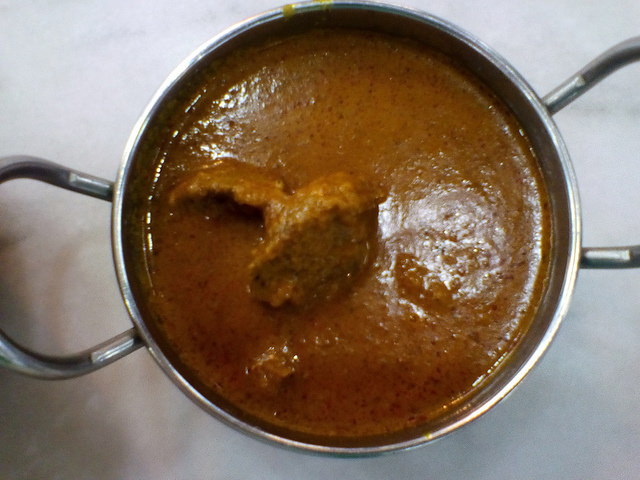 Nothing beats the true Indian flavor and uniqueness of Punjabi chicken curry. It is a soul food in India; a regular item on the dinner table of Indians who like non-veg food. This curry is light and almost broth-like. Using whole chicken joints is important, as it really rounds out the flavors of the dish. If you have a friendly butcher, ask him to joint and skin chicken pieces for you; if not, you can find packets of thighs or drumsticks in the supermarket. Buy tomatoes that are not too sweet, so they add a tartness that will balance the onions and give body to the curry. Using a little water to help the blades turn, blend together the ginger and garlic. Set aside. Heat the oil in a large non-stick frying pan. Add the whole spices and, once they have sizzled for 10 seconds, add the onion and cook until golden brown. Add the chillies and the ginger-garlic paste and sauté until the moisture has evaporated and the garlic has had a chance to fry and starts to colour. Add the tomatoes, salt and ground spices and sauté for 6–7 minutes. Add the chicken and stir it in the masala for 4–5 minutes – this will help develop the flavours a little more. Add enough water to come halfway up the chicken, bring to the boil, then cover and cook over a low heat for 20–30 minutes or until the chicken has very nearly cooked through. Uncover the pan, turn up the heat to high and reduce the liquid until it is thick and creamy, stirring often as you do. This will help the sauce become homogenous as well as deepen its flavours. Now add enough hot water to create a sauce the consistency of light cream. Taste and adjust the seasoning, stir in the coriander and serve.